It happened while I was asleep last night. The solstice occurred and Summer arrived. It is the best season of the year. The trees are fully green and the cicadas have been gone for about a month. July is around the corner and I just got in from getting the pool ready for another day of heavy use by the grandsons. I love the summer pool scene! The pool is in exceptionally good shape this year and that makes it all the better. 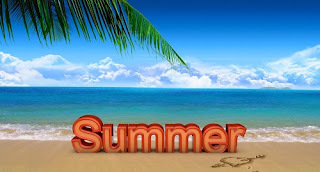 The official arrival of Summer brings with it the vacation season and the continuation of the outdoor living season. The weather has been spectacular lately. It has been hot and steamy--just like summer weather is supposed to be. The 10 day forecast is nearly perfect. A mix of sun and rain with highs in the near 90's or 90s and lows in the high 60's or low 70s. Even the Orioles, the Boys of Summer, got it right last night an delivered a win to close out Spring and begin the Summer run for the World Series. I am a bit concerned that they have allowed 5 or more runs in each of their last 17 games, but hopefully that will turn around soon. Bring on Summer and let's enjoy the heat!